After Carnival Freedoms arrival a Galveston, Texas the cruise ship has started its year round service from the port. Carnival Cruise Line is Port of Galveston number one customer so when Carnival Freedom arrived at the port for the very first time on Saturday Feb 14th it was a huge celebration. Military personnel was honored during the festivities along with their families. As part of the entertainment country music superstar Martina McBride was featured. This was part of a “Carnival Live” performance which is a new form of entertainment introduced by the cruise line in 2014. 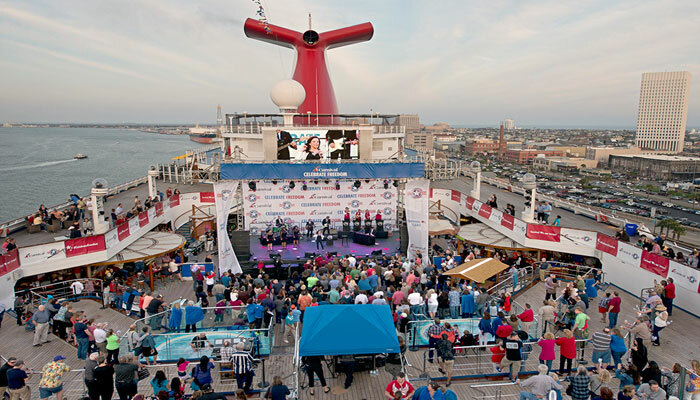 Carnival Freedom kicked off year-round departures from Galveston with a special six-day voyage to Mexico and will launch four- to seven-day cruises calling at ports throughout Mexico, the Caribbean, Bahamas and Florida beginning Feb. 21. Carnival Freedom joins Carnival Triumph and Carnival Magic in Galveston. Together these three ships will carry more than 600,000 passengers annually from Texas — more than any other cruise line. Carnival Freedom recently underwent a $70 million makeover that added an array of Fun Ship 2.0 product enhancements, and attendees at Saturday’s event had full access to the ship’s many on-board innovations, including new family entertainment programming such as Seuss at Sea and Camp Ocean featuring 200 marine-themed activities.